The kids will always love books. We have instill in them the love for reading at an early age. Now that they are a little older (still in their teens), the love for books haven’t change. They are wide-eyed when they find out that there is another warehouse sale at National Bookstore beginning tomorrow. Avail of the 90 percent discount on books and other gift items at NBS Warehouse located at 4th Floor National Book Store, Quezon Avenue corner Sct. Borromeo and Panay Avenue. Remember the date: August 13 to 18, 2015, from 9 AM to 8 PM. 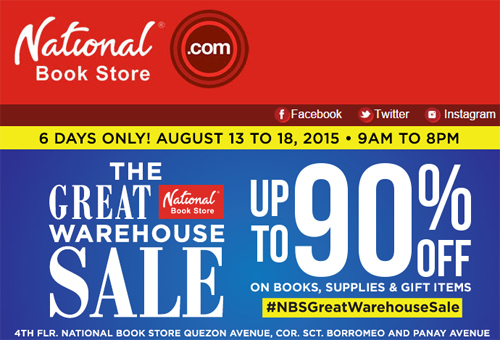 This entry was posted in Books, Discount, Fab finds and tagged the great national bookstore warehouse sale august 2015, warehouse sale on August 12, 2015 by Mommy Yam.